I walk a couple miles today, between train and tube rides, battling wind, rain, and hordes of umbrella-wielding-tourists, getting in and out of west London, for a single, one hour meeting. Everybody on the train seems to have five fidgety children, under the age of seven, racing up and down the isles, screeching with merriment and mischief. Piles of discarded newspaper cover partially eaten food, in car after car. I have rarely felt so miserable. By the time I arrive home, it's half past eight in the evening. Irritable with hunger and thirst, I fantasize about being greeted by a pretty, plushly-built wife. My fantasy wife welcomes me home, bearing an over-sized bowel of pasta, still slightly firm, smothered in cheddar cheese sauce and tomatoes, hot out of the oven. She adoringly sits me in my favourite down-filled chair, placing the comforting meal before me, with a tall, frosted glass of freshly pressed apple juice. A fire is burning in the hearth. A half dozen handcrafted, ivory candles flicker soft light on our banqueting table. The Flower Duet serenades in the background. We sup joyfully, without speaking. Tummy warm and full, I sink into a steamy, rose-scented bath, while our industrious house boy cleans up. Sipping chamomile tea, in the roomy spa tub, I close my eyes and unwind to Handel's Cara Sposa. Ah, but like a good many women, I am my own wife. And so, dreamily, set about making my Fantasy Wife Dinner. Olive Oil Spray and large rectangular casserole dish. A food processor will make light work. Pasta - 500g - Any quality Italian pasta, made to hold sauce. I recommend Radiatore, Motori, or Fusilli Pasta. If you have a steamer, fill it with water to the half way point and fire it up. You'll be using this to make the cheese sauce and soften the pasta. If you don't have a steamer, or a double boiler, you'll need three saucepans, a large one to boil water in, and a medium one, that fits into the large pot, to make the cheese sauce, and a third one for softening the pasta. Prepare your baking dish by giving it a good spray of olive oil. Make sure it covers the sides of the dish. Set aside. Whatever method you use, get your water going, while you prepare the other ingredients. Add the salt to your pasta water pot. If you've a lot of time, you can cut the cheese into chunks, place it in the bowl, or pan, with the milk and allow it to slowly melt over boiling water. Grating the cheese, however, speeds things up, especially if you have a good food processor, fitted with a grating disc. Either way, you want to melt your cheese, with the milk, over a pot of boiling water. Stir every five minutes, or so, until the cheese is completely melted and blended with the milk. Stir in pepper and hot sauce. While cheese is melting, throughly wash Broccoli and chop very fine. Peel Shallots and chop super fine. Pour olive oil into large saucepan, warm over medium heat. Sauté vegetables 10 - 12 minutes, stirring often. Set aside to add to sauce. Prepare breadcrumbs. I usually make breadcrumbs from leftover garlic bread, or any Italian style bread that's been toasted in the oven. Chop bread in food processor, fitted with chopping blade. Set aside. Wash tomatoes and set aside. if you're using large tomatoes, slice them and set aside. Toss pasta into boiling, salted water, stir gently, cook for four minutes (no matter what it says on the package) Remove pasta, strain well in colander and pour into prepared baking dish. When the cheese is completely melted and seasoned with pepper and hot sauce, add broccoli and shallots. Pour sauce over pasta. Mix well. 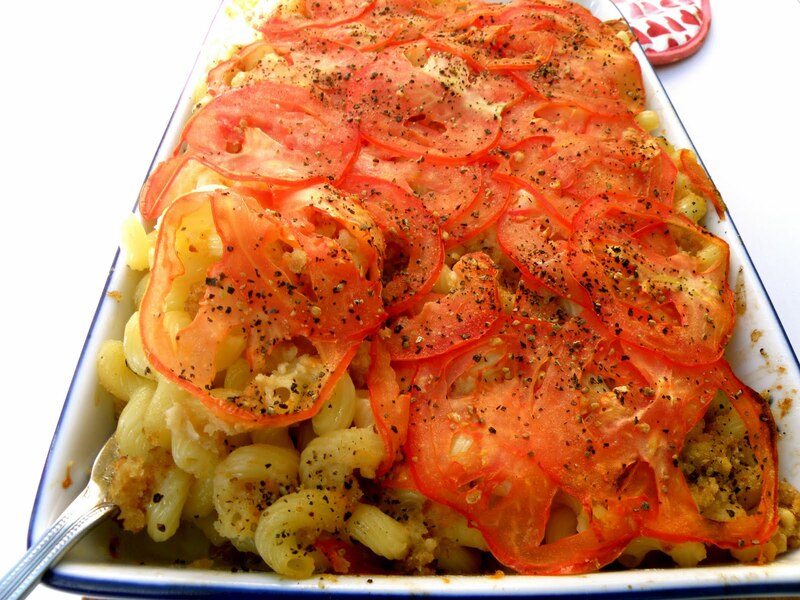 Top with bread crumbs and tomatoes. Add some fresh ground pepper, if you like. Bake in 150-C/300F oven for about 20 minutes, then brown top under grill set at 250C/500F for six - eight minutes. Sit casserole in middle of the oven for this, not too close to heat source. When the top is nicely browned and you can see the sauce bubbling along the sides of the dish, it's ready to serve. Makes enough for six as a main course. Other cheeses that work beautifully with this dish are Vasterbottensost Mature Hard Cheese, a delightfully potent cheese popular in Sweden, and Gruyere, another robust cheese often used in Fondue. Should you be in the fortunate position of having garlic bread about the kitchen, chop it into fine breadcrumbs (you'll want at least a handful) This lifts the casserole to serious gourmet food. Serve with crispy, chopped iceberg lettuce salad with Thousand Island dressing. It's a superb combination for an all veggy feast. 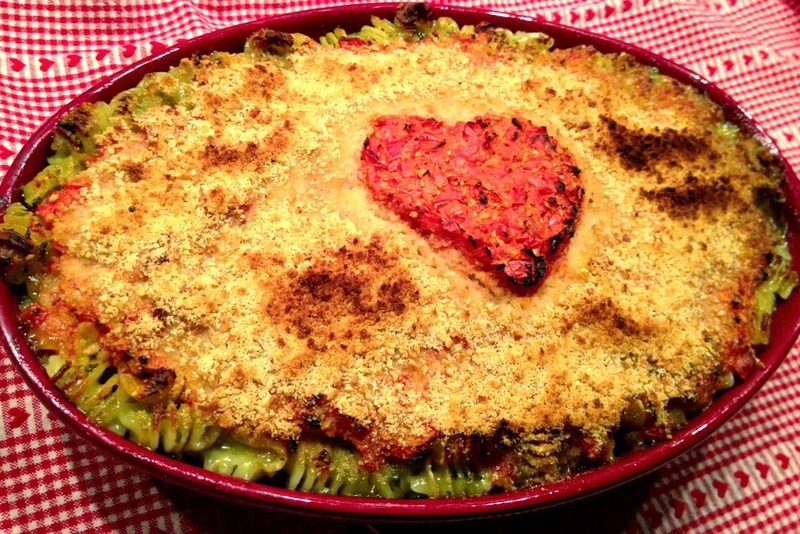 Master a Pasta and Cheese Casserole that is truly your own inspiration. 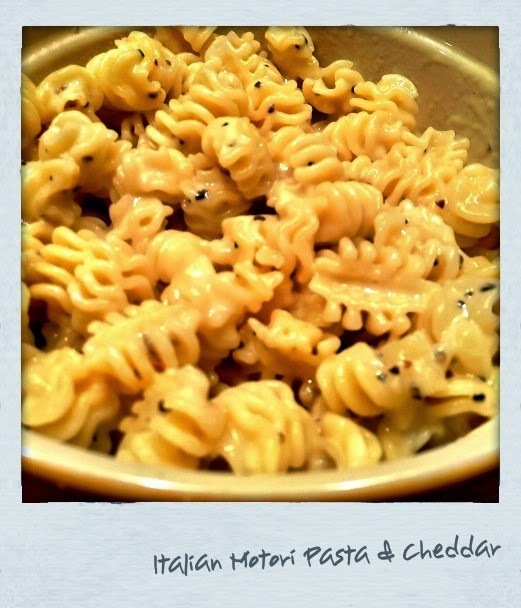 Try different cheese and pasta combinations, until you hit on the one that most inspires you. Since this is true Americana blue plate special, an assortment of old timey sodas in glass bottles (cola, orange, rootbeer, lemon lime) or pressed apple juice, are the ideal beverages. Fifties style music (Patsy Cline, Dean Martin, Frank Sinatra, Doris Day, Elvis) hit the perfect note for a cozy night in your snug nest.